In this quick tutorial you'll learn how to draw a Zebra in 6 easy steps - great for kids and novice artists. At the bottom you can read some interesting facts about the Zebra. Step 1: First draw the cone-shaped snout. The bottom line has a little bump halfway along it and is longer than the top line. Step 2: Continue a short line starting at the end of the top snout line. Add a triangle-shaped ear at the top of the head. 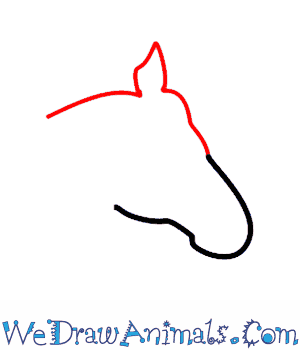 Behind the ear draw a curved line for the rest of the head. Step 3: Continue to add a long curved line for the back. It curves down toward the middle of the back, curves up and then down again at the rump. 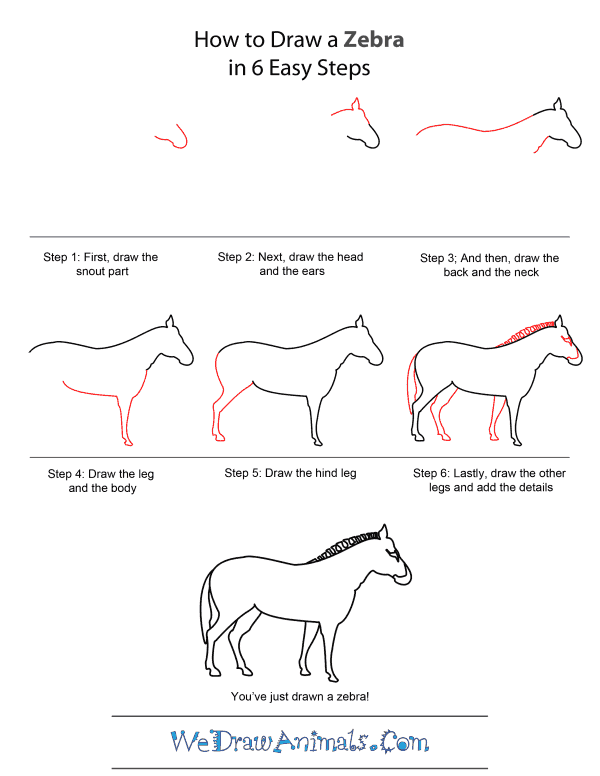 Draw a shorter line in the front to make the neck. 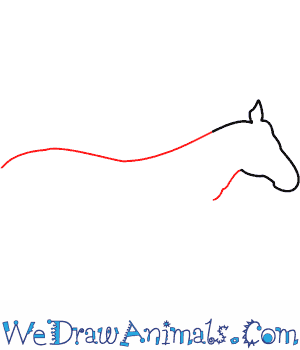 Step 4: Starting at the bottom of the neck line draw the long thin front leg. Don't forget the hoof at the bottom. There is a tiny indent or bump in at the heel. Draw the line back up. 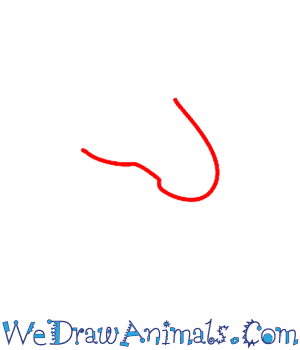 Then draw the belly line, curving it up almost to the end of the back line. Step 5: From the back of the belly line draw a diagonal line back to start the back leg. 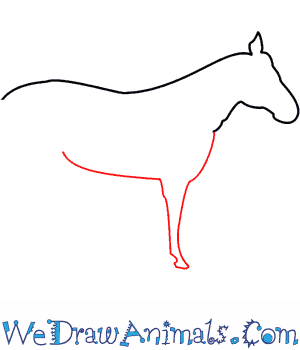 Then draw a line straight down to the hoof. Don't forget the small indent on the heel. Draw another line straight up, making a thin back leg. 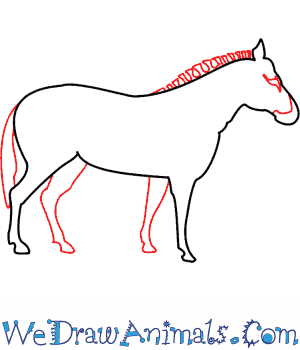 Keep drawing a curved line toward the rump. Step 6: Add another front leg right behind the first front leg. It should also be straight. 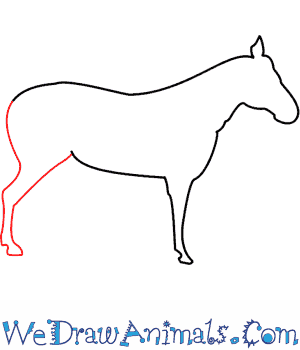 Right in front of the hind leg add another hind leg. The top part is on a diagonal and the bottom part is straight down. Finally, add the fluffy mane on the top of the back line and the tail. 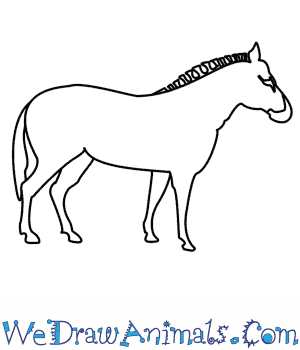 You can also add the zebra markings on the face. Zebras live in Africa and belong to the Equidae family, which includes donkeys and horses. They are recognized by their series of white and black stripes and each zebra has its own unique pattern of stripes. Zebras began to evolve about 4 million years ago and today, there are three species; the mountain zebra, the plain zebra and the Grevy’s zebra. Zebras tend to live in small groups and large herds because they are quite social. Zebras have never been domesticated like donkeys and horses have. The most common zebra is the plains zebra. The largest zebra is the Grevy’s zebra, which is also the rarest and is considered an endangered species. A zebra’s stripes may serve as identification among a group and may also serve as a protective measure against horse flies and blood-sucking flies by confusing them. Most zebras communicate by whinnying and barking, the Grevy’s zebra makes brays like a mule. Baby zebras are born brown and white. In African societies, zebras are often the subject of folk tales about how zebras got their stripes. They are also popular in art and their stripes are popular in fashion and interior design.